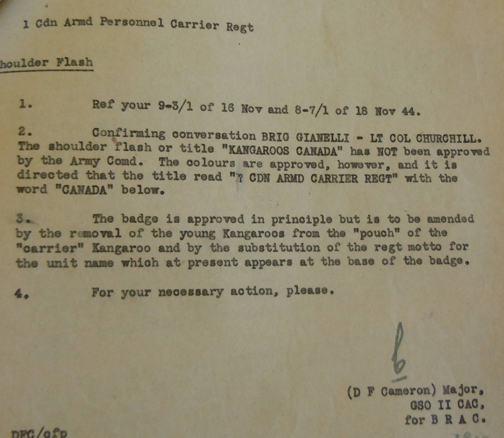 On November 16th 1944, the Commanding Officer of the new Armoured Personnel Carrier Regiment sent off a letter the office of the Brigadier Royal Armoured Corps (BRAC) requesting permission for a unique shoulder title and cap badge for the ‘Kangaroos’.Those initially proposed designs for the unit insignia are quite different from what was ultimately approved and produced. 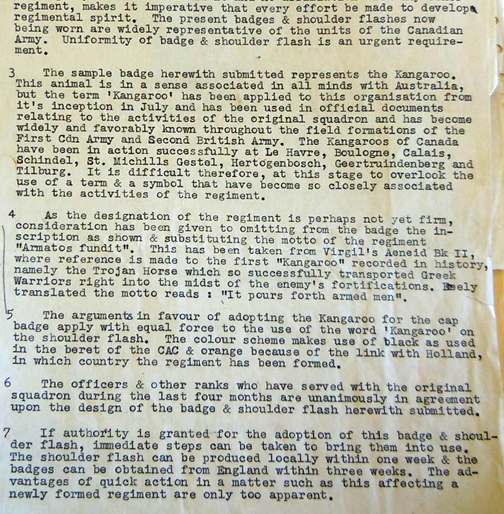 The arguments in favour of adopting the Kangaroo for the cap badge apply with equal force to the use of the word ‘Kangaroo’ on the shoulder flash. The colour scheme makes use of the black as used in the beret of the CAC & orange because of the link with Holland, in which country [it] was formed. Lt-Colonel Churchill’s justification for badges. Submitted to the BRAC office was a full colour sketch in gouache on cardboard, the words ‘KANGAROOS’ over “CANADA” in Dutch Oranje on a black background. Also attached was a sample from a local weaving mill of the type of cloth/method that could be used to produce the shoulder titles locally. Original artwork of the proposed unit shoulder title. It took the orange colour from the Dutch House of Oranje and the black from the Armoured Corps beret. 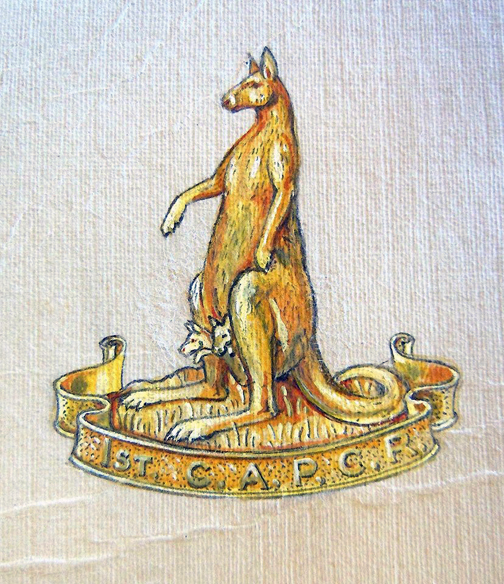 The cap badge design as provided by the JR Gaunt & Sons Company in London, England was a standing, mother kangaroo, with two young ‘joeys ‘ poking out of her pouch. Below a scroll with the current abbreviated designation of unit, 1st C.A.P.C.R. Gaunt artwork of the initial badge proposal. The inclusion of the two ‘joeys’ were not supported by HQ. Col. Churchill acknowledged that the unit’s designation was “not yet firm” and proposed a regimental motto taken from the ancient Roman poet Virgil’s account of the Trojan Horse. Greek soldiers were successfully transported into the enemy’s fortifications, hidden in the belly of giant wooden horse. ‘The new motto, ‘Armatos Fundit’, loosely translates to ‘It pours forth armed men”. Churchill was hoping to expedite his request as he felt it was imperative to quickly building a cohesive fighting unit to have all ranks outfitted with their own unique and personal identity. Churchill would not have to wait long. On November 21 he would receive his answer. Both designs were approved but with significant modifications. The approved badge. The unit title was replaced with the unit’s Latin motto which translates as ‘It pours forth armed men”. Letter from the office of the Brigadier Royal Armoured Corps (BRAC) declining the original badge proposal and suggesting alternatives. The cap badge design was to use the new regimental motto in the scroll, also the two joeys were to be removed. Churchill would later state that BRAC had sought approval higher up, from no less than the First Canadian Army Commander, General Crerar. It was Crerar whom felt the young, pouched joeys were ‘facetious’. 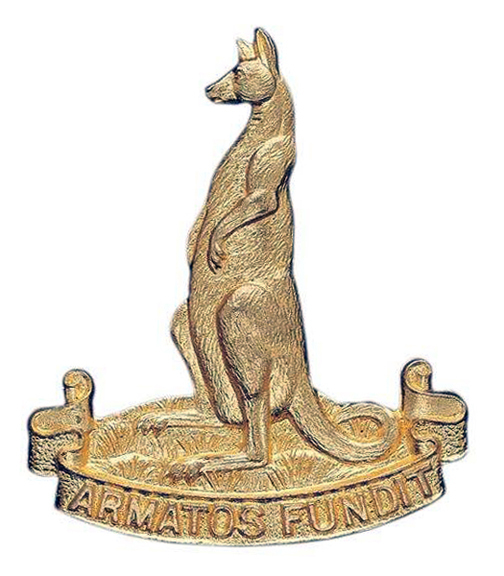 The change essentially made the kangaroo figure a male and somewhat missed the point behind the regiment’s nickname and role on the battlefield. The shoulder title design would be altered considerably. The Oranje and Black colours were approved, but the prominent use of the unit’s nickname, ‘Kangaroos’ was scrapped in favour of the unit’s designation. It was to read “# Cdn Armd Carrier Regt” over “Canada”. However, the unit’s official number, a number within the Canadian Armoured Corps Order of Battle had not been officially granted yet (and as it turned out never would be). The unit went ahead and produced an alternatively approved, shortened and abbreviated title of “Armd Carrier Regt” over the country of origin “Canada”. Still in vibrant orange lettering on a black background. The approved shoulder title. These were made in the Netherlands. The approved badges and shoulder titles would not get delivered from their manufacturers and distributed until the first week of February 1945. In the meantime, officers and other ranks of the Armoured Carrier Regiment were to wear generic cap badges and shoulder titles to the Canadian Armoured Corps.